This is the second in a series of posts about historic maps of LeDroit Park. Read the first post, The District Before LeDroit Park (1792 – 1859). Just a few years after German cartographer Albert Boschke finished his detailed map of Washington City, he completed a map covering the entire District of Columbia. 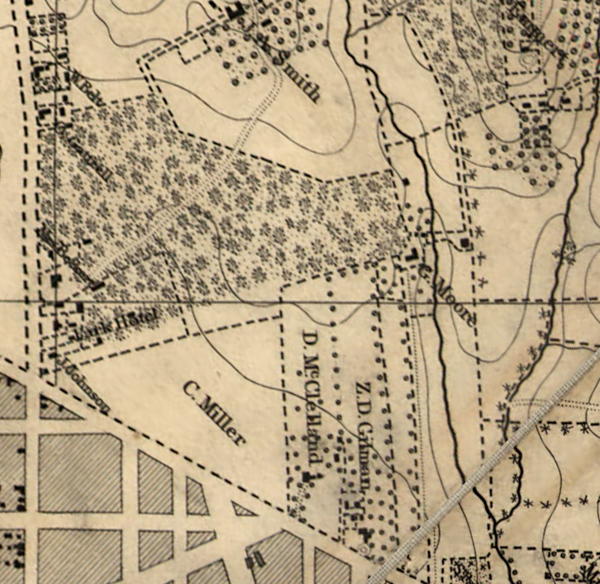 The 1861 map depicts the area around what is now LeDroit Park to be the properties of C. Miller, D. McClelland, and Z. D. Gilman. The original advertisement for LeDroit Park, entitled Le Droit Park Illustrated, also mentions the inclusion of the Prather property, which is not labeled on the map. Interestingly enough, David McClelland, an engraver, is listed as one of the publishers of the map, so we can assume that he ensured the accuracy of the parcels around his home in what was to become LeDroit Park. Mr. McClelland continued to live at 301 Boundary Street long after LeDroit Park began to sprout up around him. In fact, Mr. McClelland sold part of his property to form the neighborhood and James H. McGill, architect of LeDroit Park, designed his home, which stood where the United Planning Organization (the old Safeway) now stands. At the outbreak of the Civil War, Mr. McClelland possessed the most accurate map of the nation’s capital. In the hands of the Confederate Army, it could provide a detailed plan for marching on the capital city. In the hands of the Union Army, it could provide a detailed plan for fortifying the capital city. Mr. McClelland knew the value of what he had and unsuccessfully tried to sell it to the War Department, which got a hold of it anyway. At the outbreak of the [Civil W]ar the United States had no topographic map of the District, the only topographic map existing being the manuscript produced by Boschke. He sold his interest in it to Messrs Blagden, Sweeney, and McClelland. Mr McClelland is an engraver, now seventy-four years old, living in Le Droit park. He engraved the Boschke map, which was executed in two plates. With his partners, he agreed to sell the manuscript and plates to the Government for $20,000. Secretary of War [Edwin] Stanton, not apparently understanding the labor expense of a topographic map, thought that $500 was a large sum. There was, therefore, a disagreement as to price. After some negotiations, Mr McClelland and his partners offered all the material, copper-plates and manuscript, to the Government for $4,000, on condition that the plates, with the copyright, should be returned to them at the close of the war. This offer also was refused. There then appeared at Mr McClelland’s house in Le Droit park a lieutenant, with a squad of soldiers and an order from the Secretary of War to seize all the material relating to this map. Mr McClelland accordingly loaded all the material into his own wagon and, escorted by a file of soldiers on either side, drove to the War Department [next to the White House] and left the material. The Committee on War Claims compensated Mr. McClelland in the amount of $8,500 and never returned the maps. [T]he companies formed and took up their march … to a part of the city now known as Le Droit Park. This section now well built up was then open country the farm of Mr. Moore. In a grove of scattering scrub oaks near the present intersection of Fourth and Wilson [now V] streets the camp was established and named Camp Meigs. Mr. and Mrs. Moore and their two daughters, with two or three colored servants, were well-to-do and hospitable people of Union sympathies. Some of the officers messed in the house and a few averse to living in a tent had rooms here. On a recent visit the writer found Mrs. Moore still living, about eighty five years of age, and her two daughters with her. Her mind was clear, and her memory of the officers and some of the men very accurate, and not unkind, although there were at that time many things that were annoying to the family. Next: The Civil War ends and Howard University is established with land that a trustee, Amzi Barber, sells to… himself. Wow, another truly wonderful piece and portion of a map. Thank you for taking the time to research and post!